Right after I graduated from college, I spent two years in Munich (München), Germany. It was an eventful time in my life. It was the first time I’d ever lived in a metropolitan area. Turns out I’m a city dweller at heart. Also, my first son was born. Yeah, that was a big one. It was an amazing time in many ways. It seemed there was a surprise, a new experience around every corner. One of the most beautiful was seeing the Kristkindlmarkt on Marienplatz. There had been snow early and often our first year, so there was a frosting of snow on the buildings and some of the stalls as we wandered the market looking at the handicrafts – we bought crystal tree ornaments. All the while the pungent aromas of glühwein and roasted chestnuts filled the air. Despite the fact that it wasn’t Münchener Glühwein, I was excited when I saw this on the shelf of a local supermarket in January. Even though the holidays had passed, it was still cold enough to warrant a nice warm beverage. Notes: The color of this spiced red was a pale garnet. Not surprisingly, the bouquet held scents of winter spices – esp. clove – and dark fruit. Directions on the bottle instructed me to heat the wine to 170 degrees Fahrenheit without boiling. Once that was done, we were able to pour it into our holiday mugs. Yes, we have holiday mugs! I found this wine light-bodied with good acidity and no noticeable tannins. Sweet at 10% alcohol, the Gerstacker Glühwein was a mug full of plummy, berry, spicy goodness. It was simple, pleasant, warming enjoyment on a very cold night. Temperatures outside were in the teens, but the warmth of this spiced wine and the memories it brought to mind kept us cozy inside. For an hour or two, it was the holidays all over again. Guenoc Vineyards has an interesting history steeped in the glamorous world of actors and high society. Oh, yes! Guenoc started life as the Langtry Farms or Langtry Estate Vineyard. 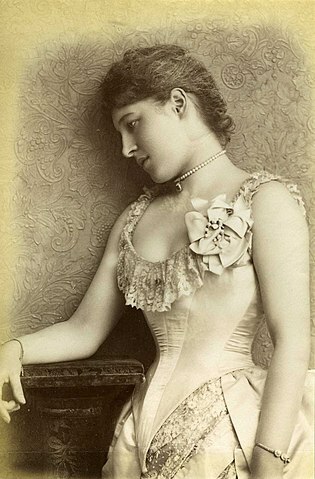 Lily Langtry (also spelled Lillie) was an international star of the stage and belle of society in the late 19th and early 20th centuries. She was also possessed of an entrepreneurial spirit which led her to found her own acting company, involve herself in thoroughbred racing, and to become a California vintner. Born in the UK, Ms. Langtry became an American citizen in 1887 during one of her tours through the U.S. In 1888, she bought the winery in Lake County, California and reportedly began making claret. Although she sold the vineyard in the early 1900’s, the farm is today being used to produce the many selections available from Guenoc and Langtry Estate. Notes: This Guenoc Chardonnay was a medium yellow in the glass. On the nose I caught whiffs of honey, kiwi, and banana. Acidity was good, and alcohol was at 13.5%. On the tongue I found tropical fruit – kiwi, banana, even a touch of guava – and quinine. On the whole, however, it wasn’t my cup of wine in large part due to the prevalence of the quinine flavor. If that flavor had taken a back seat to the fruit, it could have added interest to this Chardonnay. For me, though, the bitter quinine was just too much. You, of course, may disagree. As Guenoc does make a full range of offerings, this won’t stop me giving their other products a go. Awhile back fellow blogger and wine enthusiast Lulu said she’d found this Sicilian red at her local Trader Joe’s and really enjoyed it. That was enough for me! Notes: Here is another varietal that I’ve just barely stuck my big toe into. I.e., I’ve had limited experience with these wines and am still learning as I trundle along my circuitous wine journey. The last one I tasted brought a very dark flavor profile to the palate. This selection, however, was quite a different experience. The color was dark — a deep garnet. In the bouquet I found earth, oak, ripe berries and a touch of smoke. The body was on the lighter edge of medium. It had high acidity, moderate tannins and 12.5% alcohol. Flavors for me included boysenberry, oak and eucalyptus. I felt it was a simple, pleasant, easy-drinking glass of wine. Absolutely nothing to complain about here in my book, especially given it’s bargain price. Thanks, Lulu, for the recommendation!